Newsflash: A nutritious lunch doesn’t have to be FRESH to be good for you. There are so many nutrition buzzwords floating around these days that people are being discouraged from eating what they’d like to eat because they think it isn’t ‘healthy’. I’m beginning to wonder if people are missing the message. I don’t know how we got here, or when we got here. I just know that here has become a place where there is a propaganda-level fear of foods recently instilled in society. If that sounds familiar, it probably is. I’ve written it before and I’m sure to write it again. There is supposed to be a message out there that can help people build a foundation for healthy eating. But … It’s getting foggy. The amount of fear-filled information on the internet continues to grow exponentially and it seems that nutrition dogma expands with it. No, you don’t need to eat cleaner, there are children in developing countries who don’t have clean drinking water. Don’t get me started on eating clean! Your food isn’t toxic and you don’t need a detox, that is literally what your kidneys and liver are for. There is too much pressure put on people to eat fresh this and organic that. How about we focus on helping people get into the kitchen to cook and put a meal together rather than judging where their food came from! I do think it’s important to eat fresh fruit and vegetables and to consume homemade food but the reality is that there are A LOT of people out there who don’t have the cooking skills to do so, many are limited by their budget and time constraints. To read more about the privilege of healthy lifestyle by Dr. Yoni Freedhoff here. Bottom line: Don’t judge people based on what they eat (or probably at all for that matter). Be open to the fact that not everyone can afford to eat the way you think is best and be proud of the food you prepare. To prove my point I made a lunch filled with processed foods, it was delicious, inexpensive and filling because you can make a meal of mostly pre-packaged, processed and prepared foods and it can still be full of micronutrients (vitamins and minerals) and macronutrients (protein, carbohydrates, fat) AKA the stuff you actually need AKA nutrition. 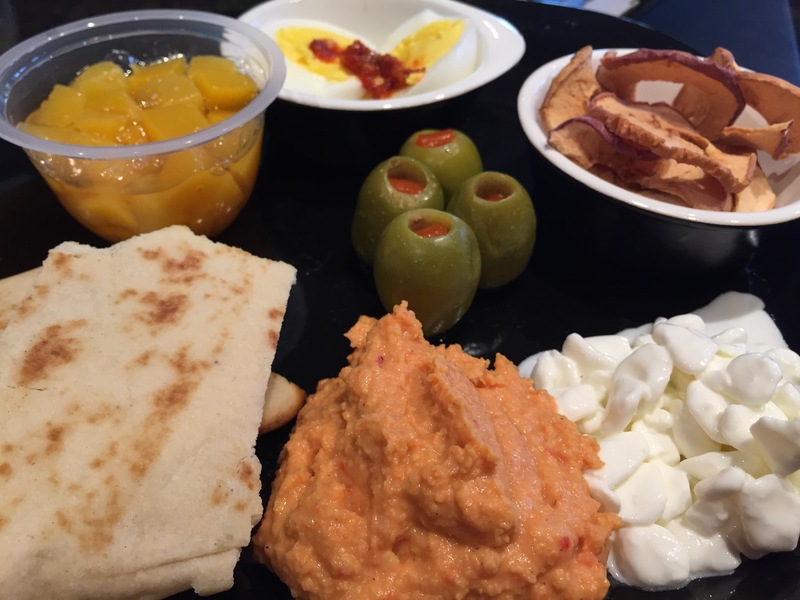 This plate of processed food includes canned chickpeas made into hummus, packaged apple chips (without added sugar), canned peaches (in water), 2% MF cottage cheese, olives, store bought naan bread and boiled eggs.